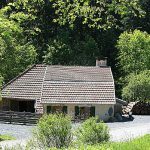 Tips for you around the Chalet - Chalet in the Vosges with view. 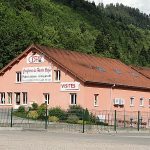 Tips for the Vosges, Lorraine and Alsace around the chalet. In the first place of our tips is hiking and cycling. With rucksack snacks, or a comfortable pause in a guesthouse. The French make a fine distinction between going for a walk, promener and randonner, hiking. Hiking, randonner is at least 10 kilometres; the physical challenge is more stressed by them. But also the tip to make a larger walk, does well to your circuit. Mens sana in corpore sano, a healthy mind in a healthy body. Keep an attentive eye on the unique flora and fauna. The Vosges with its ice-age past are standing for wide, lonely forests and a unique flora and fauna. On a hike, sometimes, you meet rare flowers or butterflies which have long been extinct in other areas. Have you ever seen a fox, a badger, a roe deer browsing in the clearing, or a hart in the wild? No? Here you have a real opportunity. Also, the shy lynx and the chamois are belonging to the Vosges, but very rare. Some, might have watched the wolf. Cultural-historical sites and craftmen activities. Nearby in every little village in the summer time you can be part of a particular craftman demonstration, as well as from ancestral handicraft. There are numerous museums too, for example the so-called Ecomusées, in which the past is preserved. For further information and details about the tips, please click on the picture. Lake Longemer at the jetty. If on warm days swimming fun is a keyword for you. 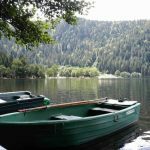 The lake Longemer will be in midsummer a little calmer alternative to the swimming lake Gerardmer, which is very visited at that time. Lake Gerardmer. Flowered water front. There is always something happening here. 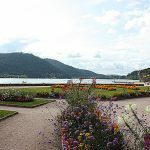 The most popular city Gerardmer, “the perle of the Vosges” has a well flowered water front and seduces for riding rowboats, to swim, or to make a little tour with a sight seeing boat. The climbing park Acrosphere, located in a former granite quarry in the middle of numerous trees, is a really remarkable setting. It is a recommodation for all, who love sporting activities. There are different difficulty levels in the park. In the months of July and August its opened every day from 10 to 18 h.
Rainy day tip: Fabrication of wooden clogs. Fabrication of wooden clogs. Gerardmer. The everywhere known Dutch clogs found here in the Vosges her counterpart in a slowly getting forgotten profession, which unifies art and know-how. Rainy day tip: Sawmill museum Lancoir. The sawmill museum Le Lancoir in the valley of Le Défilé de Straiture. It is the unique final witness of a past rural industry. Lancoir is still completely operational. Rainy day tip: Confiserie CDHV. Sweet making in the Vosges at Habeaurupt. Artisan production of sweets in the confectionery Confiserie des Hautes Vosges CDHV. A tip for a rainy day, which is absolutely not a less-than-ideal solution. Manacha Kart, an adventure for young racers. Manacha is a Go-Kart track in the open air at the Col du Plafond, between Anould and Gerardmer. For all young and not so young participants a terrific fun. A tip around the chalet is the leisure park Fraispertuis. 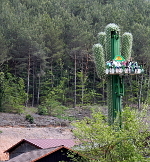 The family-friendly leisure park Fraispertuis City in the Vosges. 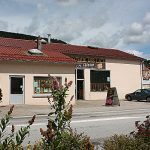 It is situated on the road from Saint Dié to Epinal approximately in the middle of both. Among the attractions is the second steepest roller coaster in the world. Furthermore, there is a new attraction every year and you’ll get a hint how to avoid that your children get lost. Let us know your tip. For many years we choose France for our holidays. There is a reason for. The French Way of Life is proverbial. The people, their culture and the German-French friendship make the holidays always to an absolute experience. Still, we discover something new and perhaps you ahead of us. Let us know, when you are impressed by something.